Inside a former high school in Phenom Penh that was turned into a prison and torture center, and is now a museum. Branson Quezner photos. 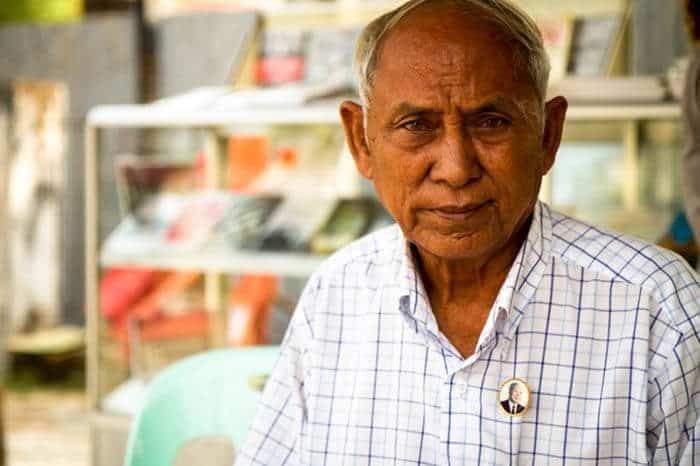 Chum Mey is a survivor of the camp, and today he sells his book and talks to visitors about the horrors of the Khmer Rouge era during the 1970s in Cambodia. Unable to skirt the issue, politics is a big deal in Cambodia. And no matter which political ideology you subscribe to, Cambodia has a flavor unique to its own. Tourism accounts for a large portion of the country’s GDP along with its garment industry, and aid is generously gifted to Cambodia despite it having around a 7% economic growth rate (2015). Ankor Wat in Siem Reap steals much of the attention and for good reason too. It is ancient history of the Khmer people to be explored and wondered about. 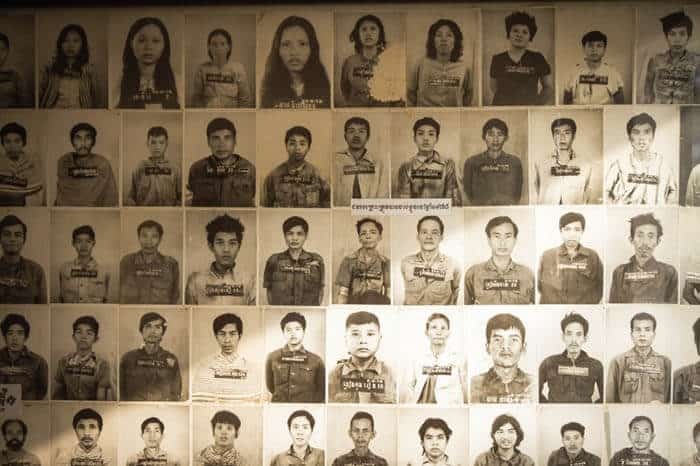 However, in Cambodia there is a shadow that has been cast over its people which still haunts them today and plays a significant role in the conscious of Cambodians. This is of course the legacy of the Khmer Rouge, the ravishing army of Pol Pot’s extreme vision of collectivization. Describing it as a rough patch in recent history grossly underestimates this socio-political event. This horrific episode directly affected the whole country and estimates of 1 in 4 people were killed. It truly was inescapable and today tourism in Cambodia does not simply highlight the beauty and tranquility of Cambodia, it also shares its tumultuous past. 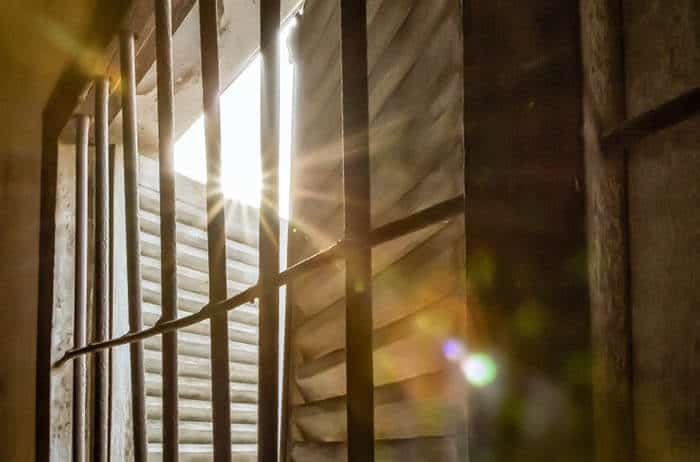 A ray of light comes into a former classroom that was turned into a prison cell at S-21 in Cambodia. In the capitol city of Phnom Penh, literally meaning ‘Penh’s Hill’ there is an extreme example of how quickly institutions can change from the best of one’s society into the beast of it. Chao Ponhea Yat High School was not much different from any other high school. Students came to learn, fulfill their dreams, get into mischief during break and even to find a boyfriend or girlfriend. Sadly, this came to an abrupt end when the Khmer Rouge came into power. Out of the jungles they stormed and into the cities they advanced. Education came to a quick end and those who showed signs of being educated, from wearing glasses to being literate were punished and slaughtered. This high school soon took on a new name, S-21. The school became a prison as electric fences kept people from escaping. Ironically the school, with slight modifications became a perfect place for a prison. The administration offices which were used to enroll students became offices to enroll new prisoners, where they endured their initial interrogations and enrolled in a life of hell. The classrooms turned to holding cells. The communal bathrooms would not suffice for sanitary conditions and disease grew rampant. Guards made rounds in the playground and checked on the prisoners shackled to the floors. A true place where hope turned to horror. The atrocities and the stories can be found in autobiographies and movies which give graphic accounts of the heinous crimes committed, and thus for now, we will look at its importance as a tourist destination. This is a place that has a terrible history from the years of 1975 to 1979 and thus appropriate behavior should be observed. Generally long trousers are preferred for guests. Also, generally maintaining a quiet and reserved demeanor shows respect. As with any war memorial or death camp, bearing on the side of humility is always best. Entering the facility there is a large rectangular grass courtyard lined with palm trees. The buildings have open walkways facing towards the central yard where students would have scrambled from class to class. On three sides buildings stand forming a large “U” shape leaving one side of the complex exposed. There are information boards that give an introduction to the site and also a viewpoints of how present day Cambodians value the lessons they have learned from such a traumatic time. 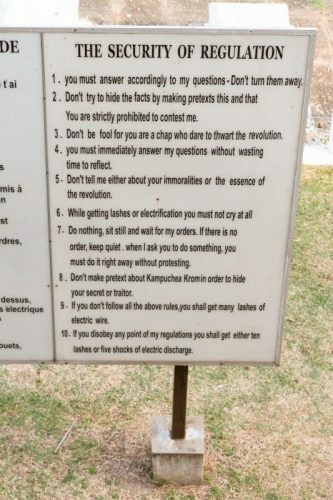 The arcane rules of the anti-education Khmer Rouge regime were very tough on prisoners. Up a flight of stairs and into the first of the classrooms turned prison cells you begin to see the transformation from a learning institution into an instrument of terror. Original remnants of shackles, beds, and torture apparatus are out on display. Moving from room to room you see the horrific evidence of human suffering. And what makes this story all the more appalling is that the victims were persecuted by young teenage and child soldiers conscripted into the Khmer Rouge fighting force. Rusted chains lay on the floors and bars still encase the windows. In the second building the crimes become more personal and more objectionable. Each person entering the prison was photographed. They were then given numbers along-side of their names. Still today, the whereabouts of all the photographs are not known. But the ones they do have and have identified make a mural on the wall of hundreds and hundreds of black and white photos where a blackboard would have hung. 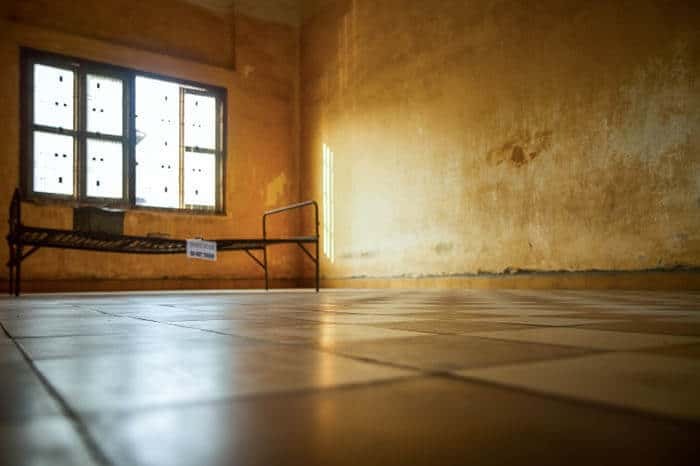 The classrooms where divided up into separate stalls where prisoners were isolated from each other and chained to the floor. The young guards would make rounds physically and mentally abusing the prisoners. The vast majority of these horrors are lost. But the ones that still exist are in the stories of the seven survivors shedding light on the dark world of S-21. The youth are also encouraged to visit so that their future is more likely to be ensured a more pleasant one by committing to memory a world they had the pleasure not to live in. Monks young and old also wonder the grounds contemplating, meditating and evoking forgiveness for all. From anywhere in the city, any tuk tuk driver, cabbie or hotel concierge will know the name, “S-21.” They are not shy about introducing you to the horrors of their recent past. Quite the opposite, they are happy you are interested in their history despite the blemished stain on it and hope that you will walk away with a little more compassion. They wish not to forget, so it will not happen again. The past is done and their Buddhist ways have let them remember the atrocities, yet to also let them go. 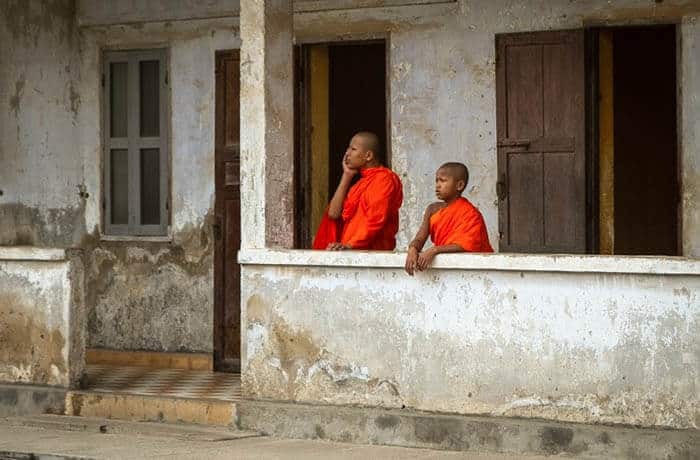 Young monks get an education about their country's terrible period in the 1970s when mayhem ruled. S-21 is located on Street 113 between Street 320 and 350. The summer heat can be overbearing so an early start is a good option, and even in the winter months, getting there when it opens will help you to avoid the crowds. As many people on the SE Asian tour only hit up the major attractions of the Royal Palace and Ankor Waht, S-21 is a great option to stay away from the large tour groups. Moreover, its modern historical significance should not be missed. The gates open at 7:00 am and remain open until 5:30 pm. So if you are an early riser, after enjoying a condensed milk sweetened coffee in a reclining wicker chair in one of many local cafes you can arrive before the heat of sun and other visitors. On the other hand, if you prefer the evening you can enjoy an afternoon walk around the grounds and then drink away your emotions with a cool Ankor Beer before dinner. 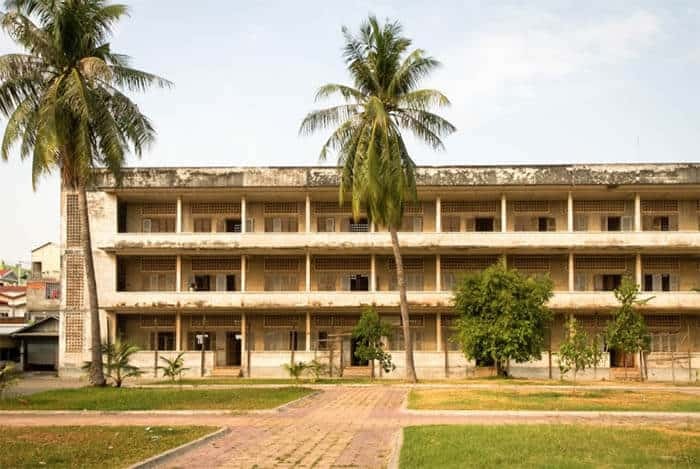 Chao Ponhea Yat High School was turned into "S-21" a notorious prison and torture center during the Khmer Rouge era in the 1970s in Cambodia. Today it is a museum. If you are travelling on a shoestring, the admission price is only around 2USD. That even leaves you a little extra cash for a donation to the museum or a signed copy of an autobiographical account of the grueling and deathly events of S-21. There are only three remaining known survivors from the camp. Mr. Chum Mey is a survivor and spends his days at the prison camp sharing his story, selling his book, signing autographs and taking pictures. Therapy comes in many forms and he chooses to survive in this manner. He was spared his life as he was crafty with his hands and could fix things such as typewriters which the guards used to catalogue new prisoners. Mr. Vann Nath is another survivor who has also written a book about the events that transpired at S-21. Having a guide is worthwhile and an extra 6USD will accentuate your visit and contribute to the museum. Busts of Pol Pot are now ironically caged. Paul Pot was the leader of the Khmer Rouge who died in 1997. If you are in Munich, Dachau is a solemn but necessary visit. If you are in Poland, Auschwitz is generally a place which people try not to miss. Hiroshima or Nagasaki play similar roles in highlighting the atrocities of war. In China, Nanjing takes a forefront in the barbarisms of invasion. The ‘Trail of Tears’ highlights the brutal western expansion by the United States with the victims being the Native American Indians. Well in Cambodia, there are about 150 camps. S-21 is just one of these. While it is not a beautiful beach or an amazing view from a mountaintop or a romantic candle light dinner, it is the nation’s reality. S-21 is worth a stay in Phnom Penh for a day. After S-21 you can see the lovely sights, or if it has inspired you to know more about the true events of the Khmer Rouge go check out the International Criminal Court (ICC) trials that are still being conducted today. They are located on the outskirts of the city and you MUST have long trousers, a button up shirt and no cameras are allowed.